Enzymes are extremely vital to human well-being. They play a critical role in digestion and nutrient assimilation, in immune response, cognitive acceleration, and cellular detoxification among other things. Enzyme therapy has shown incredible promise in natural protocols for cancer since the early 1900s (1). In this article, you will discover how to use systemic enzymes for cancer. Enzymes are some of the most important structures in the body. They are long-chain proteins that take on specific shapes and act like a key to unique locks throughout the body. Their job is to carry out very specific functions throughout the body. They assist the body in healing and regenerative functions as well as immune system modulation that plays a very important role in disease development. Enzymes are biocatalysts that are used to carry out and speed up the process of chemical reactions in the body. We have roughly 3000 unique enzymes in our bodies that are involved in over 7000 reactions. We also consume enzymes when we eat raw, sprouted and fermented fruits and vegetables. Supplementing with an array of plant and mammalian enzymes has been shown to have powerful health benefits in a number of different health conditions including cancer (2,3). Cancer cells are covered in fibrin which is a thick outer coating designed to prevent the bodies immune system from identifying and destroying the cancer cell. This fibrin defense keeps chemotherapy out of the cells unless industrial strength doses are used. This high dose chemotherapy is also extremely toxic to the body. Systemic enzymes have been shown to break down the outer fibrin wall of the cancer cell making it easier for chemotherapy to penetrate and destroy the cancer cells (4). This allows lower dosages of chemotherapy to be used. Enzyme therapy has also shown to reduce the side effects of chemotherapy and reducing the debilitating muscle wasting that chemo therapy produces (5). Patients undergoing chemotherapy often have many side effects such as nausea, vomiting, diarrhea, pain and fatigue. Research has shown that enzyme therapy reduces these symptoms by reducing the cytotoxic effects of chemotherapy to the rest of the body (5). Radiation treatment damages the organs it is affecting and creates rigid scar tissue build-up throughout the organ. This restricts the organs ability to function. Systemic enzyme therapy prevents this scarring and breaks down existing fibrosis to enhance the organs function. They also improve outcomes associated with surgical procedures (6). Patients report faster recovery when using systemic enzymes before and after the surgical procedure. Enzymes have also shown to decrease inflammation and boost specific cytokines and improve the potency of macrophages and killer cells (7). The macrophages and natural killer cells are specific immunological cells that go through the body and hunt for abnormal cancerous cells and cancer initiating viruses. The more effective this part of the immune system is the less chance of cancer development, growth and metastasis. Systemic enzymes work to modulate or coordinate the activity of various immune complexes and have no major adverse reactions (8). They work as a lock and key mechanism and have an affinity for proinflammatory cytokines such as Tumor Necrosis Factor (TNF) and C Reactive Protein (CRP). They also downregulate the overactivity of Tumor Growth Factor-Beta at the RNA and protein synthesis level. Systemic enzymes are also known to bind irreversibly to antiproteinases such as α-2-macroglobulin and α-1-antitrypsin (9). This leads to the synthesis of antiproteinases which inactivate other proteinases such as cathepsins which are thought to play a role in tumor development and metastasis. The ratio of proteinases to antiproteinases is increasingly being used as a prognostic marker in oncology (9). The cysteine group of proteinases such as papain and bromelain are known to influence the balance between proteinases and antiproteinases and influence tumor metastasis through this. Enzymes interact with adhesion factors such as CD-44, CD-49, CD-54 and CD-58 which play a role in tumor growth and metastasis (10). Enzymes also enhance anti-oxidant enzymes and reduce the amount of reactive oxygen species and free radical damage that initiates oncogene expression and development (11). Systemic enzyme preparations are carefully formulated so they do not dissolve in the stomach acid and are able to get into the bloodstream fully intact. The best systemic enzyme supplements use a variety of plant and animal enzymes. Three powerful plant based enzymes include papain, rutin and bromelain while mammalian enzymes include trypsin, chymotrypsin and pancreatin. Systemic enzymes are consumed on an empty stomach, enabling them to be absorbed into the blood stream to travel “systemically”, working throughout the body. Systemic enzymes are protease enzymes that break down protein, and certain proteases have been shown to exhibit profound fibrinolytic and anti-inflammatory activity. 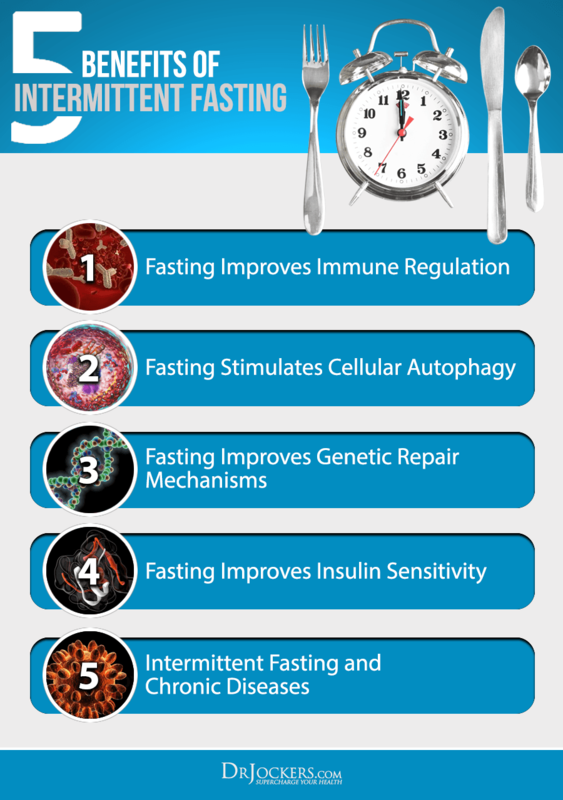 Intermittent fasting used with systemic enzymes maximizes the benefit of both. Intermittent fasting for periods of 16 -18 hours without any metabolically dynamic foods or drinks has been shown to improve the immune system and boost human growth hormone. It also improves hormonal signaling in the body and stabilizes blood sugar and enhances fatty acid metabolism. Systemic enzyme therapy must be done during periods outside of the digestive window. An individual who is eating throughout the day will not have a long enough fasting window to effectively incorporate high dose enzyme therapy. Most people do best when they use the morning hours to fast on water and cleansing beverages such as green drinks, herbal teas and lemon water. This is the ideal time to use high dose systemic enzymes. Additionally, it is always advisable to finish eating several hours before going to sleep for optimal digestion and immunity. So using high dose enzyme therapy right before bed is another ideal window of delivery. Here are several protocols for using systemic enzymes. When used in protocols for cancer, it is important to remember that extremely high doses may be warranted. This is not meant to be a treatment protocol, but an idea of how many practitioners use systemic enzymes for various cancer cases. Do not take anything written in this article or on this website as medical advice. It is mean for information purposes only and the reader is 100% liable for any complications that occur by following or not following these suggestions. Side effects to look out for with systemic enzyme usage would include nausea, diarrhea, dizziness, poor blood clotting or stomach pain. If you notice any of these, stop taking the enzymes until the symptoms subside and then begin with a lower dosage and see if the symptoms return. 1. Beard J. THE ACTION OF TRYPSIN UPON THE LIVING CELLS OF JENSEN’S MOUSE-TUMOUR: A Preliminary Note upon a Research made (with a Grant from the Carnegie Trust). British Medical Journal. 1906;1(2351):140-141. 7. Sophie Lanone , Robert M. Senior, Jack A. Overlapping and enzyme-specific contributions of matrix metalloproteinases-9 and -12 in IL-13–induced inflammation and remodeling. Elias Published August 15, 2002 . Citation Information: J Clin Invest. 2002;110(4):463-474. 10. Ween MP, Oehler MK, Ricciardelli C. Role of Versican, Hyaluronan and CD44 in Ovarian Cancer Metastasis. International Journal of Molecular Sciences. 2011;12(2):1009-1029. Great article, Dr. Jockers! I don’t see a particular enzyme recommended here, but heard you mention Wobenzyme on your interview podcast with Ameer Rosic. Would the Garden of Life Wobenzyme N supplement work for the enzyme therapy you mention above? Thank you! Yes Christina, that is the product I personally use and recommend for my patients. Hi Dr. Jockers, I first heard of you through watching your interview on the first Quest for the Cures conference. As a believer, I was very impressed and thankful that you mentioned God since so many in the natural/holistic world tend to leave God out of the equation. I’ve been following you on Facebook ever since. I am a 2 time cancer survivor and have been cancer free for about 2 years. Unfortunately, I used conventional methods because of lack of knowledge. Cancer was a gift from God as He opened up my eyes to the importance of health and nutrition. With God’s strength, I changed around my diet and lost over 100 lbs. I still have a ways to go. I’ve been thinking of adding enzymes to my supplement protocol. I heard Dr. Majors mention proteolytic enzymes tonight on the Natural Cures Summit and I was wondering if the systematic enzymes would be better or are they similar? Do the enzymes you recommend interfere with any other medication or supplement? Also, would I also need to purchase additional enzymes to take after I eat? is the product I use and what Dr Majors was talking about. You take this between meals so it acts as a “systemic enzyme” rather than a digestive enzyme. It is highly adviseable to use a digestive enzyme whenever you are having solid foods and especially cooked foods too. Thank you so much for the links and your response. I realize how busy you are, and I truly appreciate you taking the time to respond. I’m planning on purchasing both of the enzymes. I’m on a variety of supplements including Lipo Gen since I don’t have a gall bladder as well as some prescribed medication (Lisinopril, Metformin, Levothyroxin- my weight loss has lowered these dosages). Will I be able to take the enzymes while taking all the other meds & supplements? I also wanted to do the maximized living cell & body detox. Can I do the enzymes & detox at the same time? I heard you need to detox in proper order- colon, liver, kidneys. Will the cell & body take care of it all at once? Thanks, Dr. Jockers, and God bless you for your heart and ministry to others. Your Facebook post this morning was a real blessing and reminder to me! I love your Sunday morning posts. God is so good it’s hard not to tell everyone about it! 🙂 I can’t wait for you interview in the upcoming conference! Yes you can take the enzymes and the Detox along with the meds, just not at the same time. Be sure to take those at differing times. Wobenzyme always between meals and Body Detox always at least 1 hour outside of meals or other supplements. Blessings! I have been getting your informative weekly health newsletters for the past six months or so and read every article. I have even made some of your recipes and posted your site on my FB page. I first saw you on Quest for the Cure with Ty last fall. You give sound advice and solid information based on science and a belief that God created these amazing bodies for us. I agree wholeheartedly. I thought I was doing all the right things to achieve a healthy, happy body. Obviously and much to my surprise nothing could be further from the truth as I was diagnosed in August 2011 with Lymphomaplasmasitic Lymphoma, a rare blood cancer. I believe it is also known as Waldenstrom’s Macroglobulin Anemia. I have been interested in Enzyme Therapy for a little while and continue to read anything (reputable) that I can get my hands on. Would Enzyme Therapy benefit my situation since my cancer is in the blood? From August 2011 to June 2012, I had 31 rounds of chemo to bring my protein level down (IgM). My immune system of course suffered the consequences of the chemo and because of it, I have very little immunity fighting cells in my blood. With the help of my Naturopath, I have been trying to build it back up over the past two and a half years but so far nothing has really worked. Do you think high doses of enzymes would give my immune system a big boost so that eventually my own body would attack these cancer cells? Have you ever had the opportunity of conferring with any alternative care professionals in Canada? To be more specific…Toronto, Ontario? I am Canadian as you can probably guess by my last question. I was just wondering if you might be open to conferencing with my Naturopathic doctor? I know he would be open to a conversation. Please let me know if that is a posibility and I will make it happen. My IgM level is on the rise and I do not want to go through chemo again so if you have any suggestions I would be most grateful. I would like to congratulate you on your recent marriage. You make a beautiful couple. May God bless you both abundantly and thank you from the bottom of my heart for taking the time to listen. I am so sorry to hear about this Ida, I would highly recommend enzyme therapy for you with your condition. I would begin with 20 caps a day for 3 days (as described above) and if you are able to tolerate that well for a week (without stomach and digestive pains – most common symptoms of poor tolerance) than bump it up to 80 caps daily (if tolerated well) for 3 days than go up to 160 caps daily. Thank you for all of the information that you provide! Concerning buying enzymes such as Wobenzym and/or others for various therapeutic uses, how important is it for the enzyme activity to be listed instead of just the weight and/or amount? Never mind–reference previous message concerning enzyme activity labeling. Upon closer examination of the Wobenzym N label, I see that there appears to be an enzyme activity standardization for each enzyme..based on Fib nomenclature??? ?..and the source of each enzyme is also identified. First of all congratulations for your well researched articles. Just a quick question if I may. I’ve noticed that stearic acid and magnesium stearate are two fillers in the super-digest-zine you recommend. I read in several popular sites that those two fillers can interfere with the absorption of the active ingredient. I would be interested to hear your view on the matter. Thanks a lot for the link a very interesting read! Sorry I couldn’t find it using the search. I’ve noticed you have the soy lecithin in your “ingredients to avoid” list. Is that because of the estrogenic effect? The whey powder I take does contain it and spotted that the whey you sell has the sunflower lecithin instead. Yes that is correct! I recommend staying away from soy due to the estrogenic effects and possible GMO aspect unless it is labeled as organic or non-GMO. Yes, I don’t recommend soy lecithen for the estrogenic effect and possible issues with GMOs if it isn’t organic. I recommend sunflower lecithen. 30 caps last thing at night before bed. Hey Viktors, you would want to work with a doctor to monitor the status of your cancer to determine when you can adopt a prevention protocol. Great to see this on enzymes and disease. Has anyone used systemic enzymes in dogs with cancer? Wondering if they would be same enzymes. Also above protocols do not account for weight. Any thoughts on dosage for a 55lb dog? Question, re: blood thinning affect of various Wobenzymn N dosage. I am Factor V Leiden on 2000 FU / day (one tablet) Nattokinese. My fish oil also is a thinner… I very much need info on dangers of combining various blood thinning products. I happily used Wobenzymn for many years with great result for my arthritis, later for cancer reduction, also great results!!. That was before I realized the blood thinning aspect of Wobenzymn. I’ve stopped Wobenzym since my doctor put me on Nattokinese following Factor V Leiden diagnosis…. I’d like to– and feel I NEED to — resume Wobenzymn, — if you can provide blood thinning information, please!! Hey Georgi, you have no issues using these together! Does the dosage you stated for active cancer that you apply to Wobenzym N? But Wobenzym N is in tablets, not capsules. So i’m not sure if it applies to Wobenzym N. Would appreciate it if you can clarify the dosage for Wobenzym N. Thank you so much. It is the same Lynn! I have some questions about enzyme therapy for breast cancer. 1. If I stop taking it in 3 months, my pancreas is affected by it? I don’t want to have digestion problem. I mean it might think , “I know need to make trypsin anymore because it’s given by wobenzym”. 2. I think you mentioned that it’s ok to take wobenzym with lemon water. I want to be sure about it. 3. If I take wobenzym with little protein meal, some wobenzym will be used to digest protein. But most of them can be used as a systemic enzyme? Do I need to take it only on empty stomach? 4. I’m afraid of an enema. is there any alternatives? how about Charcoal? It should not affect your pancreas production of enzymes Cheon! It is fine to take with lemon water and I would definitely recommend taking the enzymes on an empty stomach! You could try something like Glytamins which are suppositories that can provide similar benefits. Hey Calum, there should be no issue either way! I started having stomache problems roughly 3 weeks after starting Wobenzym. Although i followed directions and took it on an empty stomache I experienced nausea and throwing up, which was disappointing as I had better results from this than any of the presctiption medications I tried. I am wondering exactly what is the cause of these symptoms. Hey Heather, sorry to hear this! What this means is that your stomach lining is weak. The enzymes will irritate anyone who has very weak gastric lining or ulcers. I have started taking the Wobenzym with lemon water and have not had any of my former issues yet wonder if it’s hindering the effectiveness. Does enzymes have histamine in it? I have skin rash like hives if I eat pineapples or garlic. Will it go away eventually and should I keep eating these enzymes food? Can systemic enzymes cure an autoimmune disease such as Hashimoto’s? If so, what would the recommended dose be? Thanks! Hi Leslie, I recommend the Proteo Enzymes but Wobenzym N is a good product as well! Praying for your husband.